FireIce inventor Peter Cordani demonstrates the gel's fire-proofing. Click here to see Cordani coat his hand in FireIce and blowtorch it. (CNNMoney) -- Peter Cordani is trying to set his hand on fire. The 2,000-degree blowtorch he's holding clearly works -- it just incinerated a piece of wood -- but when he touches the flame to his palm, which is coated in a clear gel, nothing happens. He doesn't even wince. Talk about standing behind your product. Cordani's hand is covered with FireIce, a protective substance he invented that prevents fires from starting and smothers those already underway. "It's like water on steroids," he says. In 2010, more than 5,000 square miles went up in flames across the U.S.; the year before, fires damaged more than 9,000 square miles. Despite thousands of deaths and billions of dollars in property damage, there's been little innovation in firefighting. The primary tools of the trade are still water and chemical foam. In 2006, serial inventor Cordani, 49, was experimenting with protective coatings to defend homes from hurricanes. At the same time, wildfires were raging in his home state of Florida. On a hunch, he took a sample of a viscous gel he'd developed and tried a few experiments. "I stuck a Popsicle stick in it and tried to light it -- it wouldn't catch," he recalls. "Then I sprayed it on a pine tree and tried to light the tree. I couldn't." FireIce came to market in 2008 through GelTech Solutions, a 22-person company Cordani co-founded five years ago in Jupiter, Fla. with his brother, Michael Cordani, 51, and Joe Ingarra, 38, a former vice president at investment-banking firm MidCoast Financial. GelTech launched with $3.5 million in seed capital, most of it from one angel investor. It later raised another $10 million from a small group of family and friends. Last year, the company had revenue of $566,000 from FireIce and its second product line: Soil2.0, a compound to reduce agricultural water consumption. In March, the U.S. Forestry Service added FireIce to its official "qualified products list," a stamp of approval that put the substance in front of federal firefighting agencies, the military and municipal agencies. That designation also made FireIce much easier to sell to private companies, universities, research labs and homeowners. FireIce can also be sprayed on someone who has caught fire. 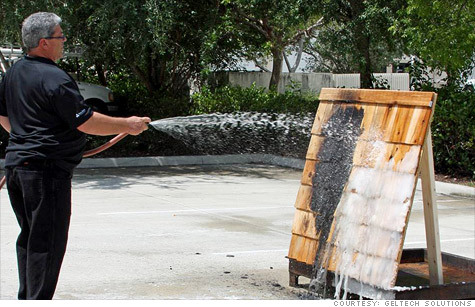 "There's not another product out there that can be put on a burning person," Cordani says. "You can't use chemical agents and you can't use water, because that creates steam so hot it will melt the skin right off your face." Other perks? Foam can blow away in the wind, but gel doesn't. Ingarra, GelTech's president, adds that although there are other fire retardant gels on the market, those are generally used for protection, not firefighting. FireIce does both. A 25-pound bucket of FireIce powder sells for $170, and two buckets will cover an average house. The company also sells a $700 attachment that lets firetrucks spray FireIce from their existing water tanks. Kenneth Hanks, assistant fire chief at Black Eagle Volunteer Fire department in Black Eagle, Mont., recently used the product on a house chimney fire. "Normally we would have used about 25 gallons of water. This time, we used four cups," he says. "I even took some and smeared it across a smoldering 2 x 4." Hanks has been a firefighter for more than 20 years and believes that FireIce is the Next Big Thing. "You get a guy coated with flammable material in an explosion, you can spray this on him. You won't contaminate the burns and the fire goes out immediately. You can even protect the burn with the gel," he says. "There's so many potential uses for it." One of the biggest challenges for GelTech now is education. Ingarra says that just telling people about it isn't enough. "This isn't something they've seen before," he explains. "They aren't used to it." The company now contracts with about 35 firefighters to demonstrate the product at fire departments nationwide, and is in the process of hiring more. David Dalrymple, owner of RoadwayRescue in Clinton, N.J., which educates and trains first responders across the U.S., teaches his clients to use FireIce. "To be honest, it's better than anything else out there that we've seen so far," he says. "It's innovative in the way it approaches fire and it doesn't damage equipment or seals. Compared to water, foam or wetting agents, this stuff is pretty fantastic."